The 2 lbs of shrimp I used for the seafood boil was actually too much for two people, so I saved it for some shrimp and grits the next morning! To prepare the shrimp, I sliced them in half and washed out any veins. This makes the pieces smaller and bite size, which helps integrate it within the dish. I had some cooked polish sausage from earlier in the week and decided to add that. For veggies, I chopped some mushrooms, red onions, parsley, and garlic. I reserved some of the parsley for garnish at the end. I started off sauteing the mushrooms, garlic, and onion in a bit of butter. Once the veggies started to soften, I threw in the shrimp and sausage and added salt, pepper, cayenne pepper, and Old Bay to taste. I then cooked the grits following the recipe on the container. Once the grits were cooked, I added some butter and diced cheddar. 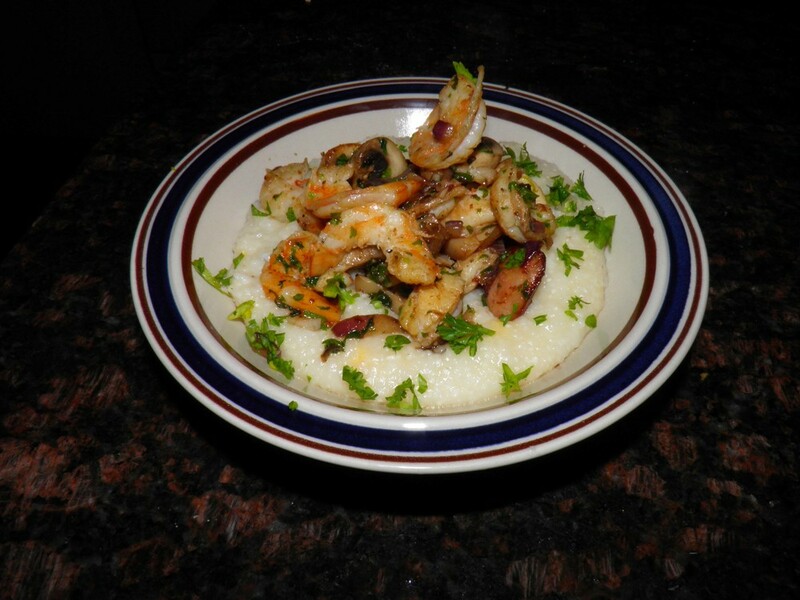 To serve, I put the grits in a bowl, added a nice heaping pile of shrimp/sausage/veggies and topped with some diced parsley.